Earlier this month, the Ambulatory Surgery Center Association (ASCA) hosted its annual conference and tradeshow in Washington D.C. Being in our Nation’s capital added additional benefits to this year’s conference, as attendees could also participate in ASCA’s National Advocacy Day. This special event taught participants about legislative initiatives pending in Congress and how to engage their lawmakers effectively. This program included a trip to the Capitol where ASCA attendees met with their representatives. SIS showcased their comprehensive suite of ASC-specific software and services. SIS product experts were at the event to demonstrate the unique value SIS solutions add throughout the ambulatory care delivery model. The growing line of ambulatory solutions includes business management solutions Advantx®, Vision™, SurgiSource®, and AmkaiOffice™, a web-based business intelligence tool, SM Analytics™, and the No. 1 ranked ASC specific EHR, AmkaiCharts™. SIS ASC advisory and revenue cycle experts were also available to discuss services offerings. SIS experts presented during ASCA 2017’s educational sessions, demonstrating their strong ASC knowledge and experience. Daren taught ASCA attendees how to develop and maintain a quality materials management program that can save ASC’s time and money, even if they work for a small ASC with limited resources. In part one of Ann’s session, she focused on ASC management, discussing the extensive knowledge required to be successful in leadership roles and she provide go-to resources attendees can use to educate and support staff in their own ASC. Part two took a deeper dive into ASC leadership and provided access to sources of best practices and web sites ASC leaders can use to further their knowledge. 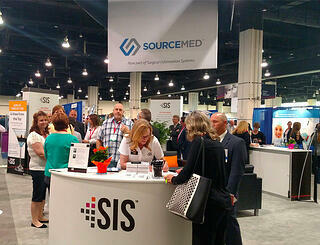 SIS unveiled their new brand and celebrated the coming together of Amkai and SourceMed. Surgical Information Systems hosted “A View from the Top” at the Pose Lounge & Nightclub on Wednesday, May 3rd to celebrate the coming together of Amkai and SourceMed. All ASCA attendees were invited to join the new SIS celebration. The combined resources of Amkai, SIS, and SourceMed will operate as Surgical Information Systems (SIS) and serve nearly 3,000 hospitals and ASCs. The combined company will leverage robust customer service and proven product development capabilities to deliver solutions to meet the evolving operational, financial, and clinical demands of hospitals and ASCs.